You're not very likely to witness any sibling rivalry when Swedish sisters Klara and Johanna Söderberg, a.k.a First Aid Kit, bring their world tour to London on Thursday night. Harmony is the watchword, as is evident from their justifiably much-hyped second album, The Lion's Roar. The record, which came out last month on London-based label, Wichita, is a country-folk set with a heavy nod to the likes of Emmylou Harris and Gram Parsons, who were also the inspiration for current single, Emmylou. Originally scheduled to perform at King's College Students' Union, First Aid Kit's only London show proved so popular that the promoters resorted to moving it to King's Cross' Scala. Below, we talk to the sisters about their big break, the new album and working with their musical heroes. You started making music in 2007 when you were still teenagers. Was it difficult getting your first record deal? Johanna: we just uploaded a couple of songs on Myspace a week after they were written and a month later we had a record deal. Klara: It all happened very fast. Johanna: It just happened. And then we started touring and we quit school and... we've been doing it ever since. Klara: We spent about two years writing the songs and it took about a month to record. We wrote a lot of the songs whilst we were on the road, touring the previous record. You see a lot of things that you can put into songs whilst you're touring. Johanna: You don't write fully-formed songs when you're touring but it's more small ideas that you can write down and record - we had six months at home afterwards so we we got to finish off writing the songs then. What's your first memory of coming to London? Johanna: I was 12. I remember going to see Mamma Mia and to Tower Records at Piccadilly Circus. I didn't think I'd be coming back here a couple of years later to play a show. Klara: Before I came here for our first live performance, I never really traveled. We only traveled to Denmark in my family, really. So it was a pretty big deal for us when we started touring. We played our first show in London. Do you remember the venue? Klara: Yeah. 12 Bar Club on Denmark Street. Johanna: And now we'll be playing our 14th show here. Any hints on what can we expect from this tour? Johanna: We're mostly doing songs from our new album. Klara: Yes. Maybe a couple of covers too. Which Emmylou Harris song would you record if you had the opportunity? Klara: Yeah, we sing it all the time. It's very special to us because it's a song about Gram Parsons. Johanna: We love Gram and Emmylou so much, it's a very special song. But people say we sound a lot like Emmylou so there probably wouldn't be much point in recording it. How did your cover version of Fever Ray's "When I Grow Up" come about? Johanna: We were on this radio show, Triple J, and part of the show was called "Like A Version", where we had to do a cover. We thought about Fever Ray because she [Karin Dreijer Andersson of The Knife and Fever Ray] obviously meant a lot to us in our career [Dreijer Andersson first signed First Aid Kit to her and brother Olof Dreijer's label, Rabid Records]. We always wanted to cover one of her songs and we thought something by Fever Ray would be perfect. That song has a tribal feel to it. It works perfectly in guitar and vocal form. Bright Eyes' Conor Oberst joins you on the album's closer, King Of The World. What was he like to work with? Johanna: It's been my dream to work with him for a very long time. And so, obviously, to get to do that was very very big for us. Klara: The first time we met him was when he was playing in Stockholm and we gave him our record. We kind of just stood there and didn't say much. It was awkward. We pretty much thought that was our last chance to ever meet him. Make an impression. And then a year later he came to our show in Austin, Texas and said he loved the record and we also met Mike [Mogis, long-time Bright Eyes collaborator] that night and then ended up working with them. It felt amazing to get to collaborate with him on King Of The World and actually write something together with him. Very special. What's more enjoyable to you: writing and recording music or performing live when you're on tour? Johanna: The two things are difficult to compare because they are so different. I think I prefer being in the studio, working on the songs. That's probably my favourite part of the process because it's so creative. There's something about hearing a song that is finished, for the first time. And seeing where it's gone. It just brings out something in me. What would you say, Klara, do you agree? Klara: Yes. I do. That's not to say we don't enjoy touring. You get a connection with the audience. You can see it in their eyes when a song really means something to someone. And they know the lyrics. There's a special connection you get. Johanna: The thing about touring is that, like, 5% is the shows and the rest is traveling. I love the shows but some of the other aspects of touring aren't as great. Klara: But at the same time, I kind of like the fact that it can be very relaxing. You're stuck in this van and you know you're going to be there for the next ten hours so you know that the only thing you can do is just sit there and relax and it's nice. A contrast to always being busy and having to run around. And presumably you also miss your family back in Sweden when you're on tour. Johanna: Well, our dad is on tour with us. He's our sound engineer. Klara: But our mum and our 8 year-old brother are back home. We hope that in a couple of years our brother can join our band. Johanna: Yes and our mum can come on the road with us too. I think she would like to be our stylist. Do you get recognised when you're in public back in Stockholm? Johanna: Well, once we got that [laughs]. But, like, in America people will come up to you instantly. In the UK people whisper more. Are you doing any UK festivals this summer? Johanna: Yes we are doing End of the Road, which we love. We were there in 2009 and a lot of our favourite artists played there so we really wanted to do that this summer. 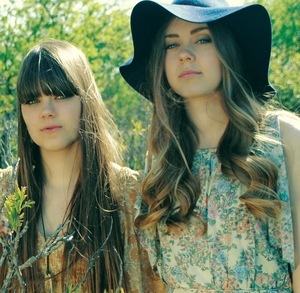 Tickets to First Aid Kit's London show at Scala are available HERE. The album, The Lion's Roar, is out now.